Brooke and Rhonda ensured we were in mixed groups of grade levels and subject areas by giving each teacher a sticky note numbered 1, 2, 3, 4, or 5. We then went to our assigned table (1, 2, 3, 4, or 5) so that each group has an established starting point. Each table had a question for the group to consider; the basic protocol was that you wrote your individual response, and then the group discussed and shared the responses. We spent roughly 5 minutes at each table before rotating to the next “station’ or table with question. You could also place a check mark next to responses from your peers that reflected your own practice or experiences. As we moved through the stations, we could see what other groups had written and shared. After we added our own responses and placed a check mark next to all answers that applied to our own practice/experience, we discussed the ideas shared from the other groups. We rotated through all stations until we returned to our station that was our starting point. We then looked at the responses shared by all groups at our initial station and grouped the responses into categories and tabulated our response to collect data to look for trends and patterns in the responses. Some groups created simple bar graphs or charts by hand; we had a teacher in our group who was an Excel expert, so she created a beautiful graph for our group. We then did a large group share out; this part of the activity was especially meaningful as fellow teachers not only shared the data, but teachers had the opportunity to talk about specific responses. This small and large group work gave us ideas and strategies for using Desire2Learn in our classrooms and was a terrific springboard for the mini-lesson on Desire2Learn presented after the activity by Brooke Webb. The learning experience and subsequent mini-lesson left me feeling energized and excited about incorporating Desire2Learn into my daily classroom instruction as well as PBL experiences for my students. After we finished the activity and mini-lesson, Brooke and Rhonda hung up our work as a gallery on the ends of bookcases in the library (our beautiful learning space for the week) so that we could browse the work more closely during our collaborative work time and breaks. This is another great variation on written conversation strategies that can encourage inquiry and crowdsourcing of ideas and knowledge. I’m already thinking about how I can use this with my 11th and 12th grade readers and writers come August! Kudos to Brooke and Rhonda for leading us through a rich and meaningful learning experience! On a side note, the learning space also facilitated this learning activity. I felt right at home in our beautiful media center because the Artcobell tables and chairs on wheels supported this kind of learning activity that involved movement as well as small group to large group work. Over the last three years, I’ve been lucky to work in a library or classroom space where I had this kind of furniture; the one year I did not, I was absolutely miserable and felt stymied by immobile heavy tables and chairs. These kinds of learning experiences are much easier to facilitate when you have a learning space that supports the design drivers of the kind of learner experience you’re trying to create. As more schools incorporate inquiry driven and active learning activities, I think it is more important than ever for schools to closely examine their learning spaces and determine what they need to change in common learning areas as well as classrooms to support the vision for learning. Today was the first day of our three day 2017 Lanier School Academy Institute, a professional learning experience for returning and new to the Lanier cluster teachers. This academy provides teachers of all grade levels and subject areas opportunities to talk about project based learning across the Lanier cluster, to unpack how our cluster thinks about PBL, and to share and brainstorm ways we can craft meaningful and authentic PBL experiences for our students (and ourselves!). I will be joining the faculty of Lanier High this July as an 11th grade English teacher, so I am excited to participate in this three day institute. After we brainstormed our list of ideas for each question, our facilitator, Dr. Kyle Jones of Lanier High, asked us to pull out the one idea from our list of ideas for each question. He then asked us to distill the idea to its essence and to write each “essential” big idea that stood out to us as a group (consensus!) on a medium sized sticky note. Each group then shared out their responses for each question; similar responses were “bundled” together by Dr. Jones to be placed in a slice of the perspective walk “pie”. Once Dr. Jones had placed the responses for the first question in the perspective walk slices, we gathered in large circle around the perspective walk pie. He then asked us to look at the responses and to step inside the slice that resonated most strongly with us. You could not “straddle” a pie with a foot in two slices; you needed to choose one that you connected with the most. Once we had selected a slice, we then turned and talked in our small groups about our ideas and thinking about the response we had selected. Once we engaged in small group talk, we then had an opportunity for three groups to share out to the entire group. We repeated this process for each question, and for each round, Dr. Jones asked for volunteers to share who had not previously shared before though you could also add to the discussion if you had previously volunteered to share. For our last round, we first considered the question, “What is your perspective?” where we picked a perception about PBL that we found most important to address or challenging. After we discussed this question, Dr. Jones challenged us to think of ways to change that perception, and after small group discussion, we then shared out once more. Approximately 50 teachers participated in the perspective walk, so this is an activity you could do with a large group or combined classes as well as an individual class. During our lunch break, Dr. Jones took each group of responses and hung them on the mobile dry erase board that is our “parking lot” of ideas (more on this tomorrow). I found this activity to be powerful because I got to hear so many interesting ideas from my fellow teachers, and the small and large group conversations gave me food for thought and pushed my thinking as well as “idea sparks” for the upcoming school year. This is an engaging activity with tremendous synergy that is participatory and builds on the power of crowdsourcing ideas and the social aspect of learning. I cannot wait to try that this activity with my new students this fall! I hope to do some additional posts about our thinking and other great learning activities we’re engaging in this week in our institute. Kudos to Dr. Jones and all the Lanier cluster teachers for such a provocative and fun morning of thinking and sharing today! We worked on this part of the activity for about 30 minutes last Friday and finished up during the first ten minutes of class this past Tuesday. Students then formed groups of three, and we reviewed the See, Think, Wonder strategy and discussed how our ideas could come from the individual activity and/or collective discussion. Although some groups needed a little nudging to get the conversation going (they were sitting silently and not conversing or trying to do the activity without talking), all groups eventually warmed up and engaged in some meaningful discussions. Groups worked for about 20-25 minutes, and then each group presented their ideas using their See Think Wonder poster they created. Afterwards, each group hung their poster on the wall in the classroom. We ended with a short discussion about each work; nearly every student wanted to read at least two of three texts! Today, I provided printed copies of interviews with each of the authors so that students could read more about each writer’s craft and approach to writing in the author’s own words. Today we also did a final wrap-up activity to pull together our noticings as we try to read like writers. I will take this list and with help from the students, craft a poster that we can hang in the room as well as mini-version for them to put in their writer’s notebooks. I think I will try this approach to introduce poetry and some genres of creative nonfiction works to the students in the upcoming weeks as they seemed to really enjoy it. How are you introducing genres of writing to your students? How do you help your writers read like writers? After attending a session at NCTE on reflective notebooks with Dr. Susan James and then doing some additional research on interactive writing notebooks over the holiday break, I decided to implement a hybrid version this semester with my War Eagle Studio writers. I love the idea of using the right side of the notebook to present content and using the left side for students to reflect, write, and/problem solve based on the mini-lesson and content for that day. I am hopeful this approach might help us use our writer’s notebooks in a more robust way that will give students some meaningful structure yet still have enough flexibility to stay true to a traditional writer’s notebook. While browsing the wonderful Ethical ELA blog yesterday, I came across a post about visual thinking strategies by Dr. Sarah J. Donovan. You read more about VTS here, but this page on VTS and a description of how a Fulton County teacher used VTS with her students in their writing notebooks, I just knew I had to give this strategy a try with my students. I plan to use both photography and artworks as our discussion starters, but I felt starting with a current event photo would be the best choice for our kickoff effort with VTS in our interactive writing notebooks today. I decided to use the photo from the “Dabbing in Congress” prompt from the New York Times library of picture prompts. When students arrived today, I had made mini-versions of the photo with our prompt, “What do you see? What do you notice?” I reviewed instructions for gluing or taping the photo prompt into their interactive writing notebooks (this was our first entry! ), and then projected the color photo onto the board with Google Slides. I told students to look at the photo and write down everything they saw; students could list their noticings as a bulleted or numbered list. I encouraged them to keep their pencils moving as much as they could and to keep digging for any detail they saw even if it didn’t seem significant. After 5-6 minutes, we then stopped and every student shared at least one noticing/observation; I recorded these in a Google Document as I wanted to see patterns of observation. I was astonished by the level of detail as well as students’ enthusiastic participation in the activity; even my 8th graders, who have been my most challenging group of learners this school year, were full of energy and excitement. What do you see? What’s going on in this picture? The “What makes you say that?” question was especially powerful in drawing out student responses and nudging them to further explain their answers or go back to the photo for “textual” evidence and details. After the first round of sharing, I asked students to look at the photo more closely and to see if they could find at least two new noticings or things they didn’t see before. This was a shorter time period of observing and brainstorming–roughly two minutes. This piece of the activity comes from the third part of VTS facilitation, “What more can we find?” I was beyond impressed by the breadth AND depth of noticings by students in every single grade level (6-8). We did one more share aloud with these noticings. I then read them a short news story about the actual event and showed a short video clip. We then pulled together the VTS activity with the actual facts of the event to talk about the teen’s actions, his father’s response, and why/when dabbing might be considered appropriate or inappropriate. It was one of the best discussions we’ve had this entire school year! Write an opinion paragraph. State whether or not you think it was appropriate for the teenage son, Cal Marshall, to dab at his father’s Congressional swearing in ceremony. Support your opinion with at least two reasons and explain your ideas. I asked students to use the left side of the notebook to begin brainstorming and then writing their selected piece. While it was not my intent in designing these prompts, both are similar in nature to the kinds of written responses/constructed responses they might see on the Georgia Milestones test in April. We’ll finish our writing tomorrow, and students will volunteer to share an excerpt or all of their writing tomorrow in class for a class share-aloud. I have our school’s awesome wireless microphone speaker system on standby so that we can elevate the level of sharing (the kids love it), plus it helps my more soft-spoken students share with their peers. I’m excited to hear their writing tomorrow and to explore the possibilities for our hybrid interactive/reflective writer’s notebooks. I also plan to make the VTS a weekly part of our writing/thinking routine as the kids were incredibly engaged with this method; I think it will also be a wonderful way to grow our powers of observations and attention to “textual evidence” and details as writers. 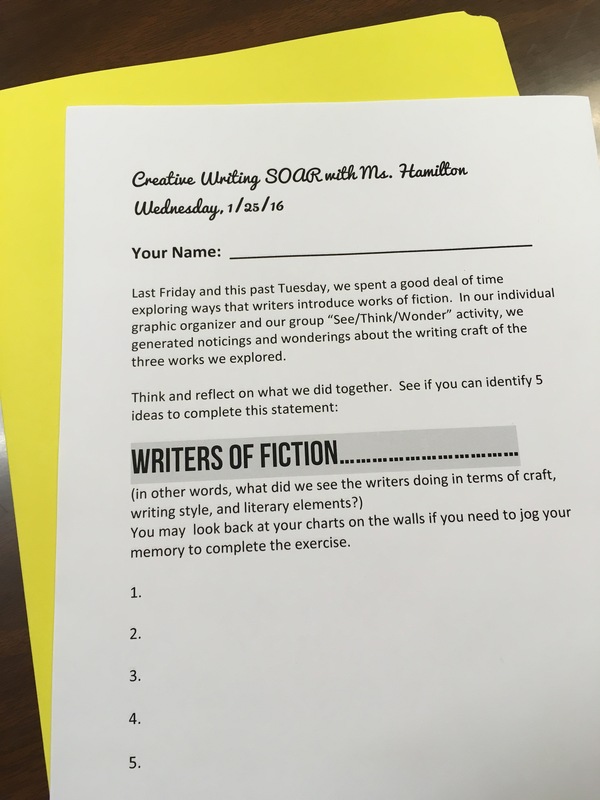 Are you using VTS or interactive/reflective notebooks with your writers? I’d love to hear what you are doing and how it is impacting student learning.